IaaS Cloud Computing might have privacy and security issues, but if we are careful, a good reduction of operating costs for the Company can be realized. Cloud computing helps enterprises to save costs, improve efficiency and to redeploy personnel in the most important area of focus for the business – this is the practical sales pitch used for Cloud Computing. IaaS Cloud Computing was discussed before in details, going a bit away from the technical points, we will discuss the cost saving aspects of IaaS Cloud Computing. 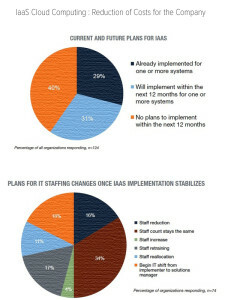 During a survey on IaaS Cloud Computing and the impact on data center design and staffing, a panel of 124 companies and professionals in the IT industry were used, they addressed some specific questions concerning the introduction of IaaS cloud computing mode for a company, the experience and benefits involved. According to the research, 29 percent of organizations surveyed have already adopted one or more systems within their own IaaS IT sector, while a further 31 per cent is planning to implement a solution for IaaS cloud computing over the next 12 months. About 40 per cent, however, has not yet planned an intervention in this regard and is attending as a spectator to the movements of competitors who are already organized in this area. As a whole, therefore, about 61 per cent of respondents are planning to introduce at least one cloud computing service in the company, agreeing well with predictions from Gartner that the IaaS market will continue to grow very fast with a rate of about 18.5 per percent during this year. The Research also has shown an incredible reduction of costs and budgets for the IT segment for about 67 percent of the respondents, reflecting the incredible savings that can be achieved by implementing a solution via the IaaS cloud computing which fits their business. The other theme of the research involves the reorganization of the human resources dedicated to the IT industry. According to what reported by the interview, 34 percent of companies that have implemented a cloud computing solution has not changed personnel, while about 50 percent have seen an increase of jobs, a new training opportunities for available resources or a reallocation of business areas, most important and critical staffs remained free from many of the previous tasks. Only 16 percent of the companies surveyed talked about staff cuts came after the implementation of cloud computing solutions. In short, the research conducted clearly demonstrate the benefits to companies that have chosen to implement an IaaS solution for the outsourcing of its equipment hardware. This helped not only substantial savings, but has freed resources that can work to improve the business areas of the company, without having to deal with responsibility to be very productive. The entire IT infrastructure without sacrificing efficient, competitive and always focused on the future of technology. This Article Has Been Shared 5434 Times! Cite this article as: Abhishek Ghosh, "IaaS Cloud Computing : Reduction of Costs for the Company," in The Customize Windows, January 4, 2014, April 18, 2019, https://thecustomizewindows.com/2014/01/iaas-cloud-computing-reduction-of-costs-for-the-company/.